The Peruvians have used the Una de Gato as a healing tonic for centuries, trusting in its cleansing abilities. Dr. Brent Davis has been working with Una de Gato in the United States since 1988. He nicknamed it “The Opener of the Way” for its profound ability to cleanse the intestinal tract and provide relief from problems in the stomach and bowels. Patients with colitis, gastritis, Crohn’s disease, intestinal flora imbalance, and even ulcers have benefited from Una de Gato. Alkaloids are the active organic compounds found in herbs and other plants. It is from alkaloids that plants derive their potent power. Six oxindole alkaloids are prevalent in Una de Gato bark. These alkaloids are what seem to give Una de Gato its unique healing benefits and the ability to enhance the immune system and gastro-intestinal tract. Studies have shown these alkaloids to be anit-viral, anti-inflammatory, immuno-stimulating, and act as antioxidants. 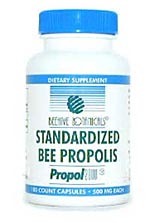 Our propolis capsules are an easy, convenient way to secure benefits of propolis on a daily basis. Ethanol-Extracted Propolis and Carob Powder, Capsule shell: Gelatin. For more information on Bee Propolis just click on the picture! For more information on Royal Jelly just click on picture!